Perfect for anyone looking to downsize or simply get their foot on the property ladder. 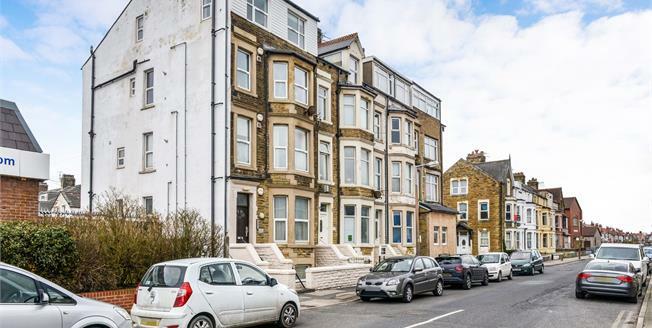 This is a tidy and spacious apartment with partial sea views from the living room bay window. The accommodation is situated on the first floor and accessed via a secure entry system, comprises, entrance hall, master bedroom, kitchen and living room. The property has gas central heating and uPVC double glazed windows. Be quick to view as this is sure to be popular. Double glazed uPVC window with obscure glass facing the rear. Double radiator, travertine flooring, part tiled walls, painted plaster ceiling, ceiling light. Low level WC, panelled bath, shower over bath and electric shower, pedestal sink, extractor fan. Double glazed uPVC window facing the rear. Double radiator, painted plaster ceiling, ceiling light. Double glazed uPVC bay window facing the front overlooking the sea. Double radiator, painted plaster ceiling, ceiling light. Double glazed uPVC window facing the front. Double radiator, travertine flooring, part tiled walls, painted plaster ceiling, ceiling light. Roll top work surface, built-in, wall and base, drawer and display units, stainless steel sink, space for oven, space for hob, space for washing machine, fridge/freezer.